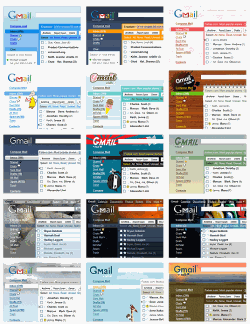 Google has officially released a set of themes for Gmail on Wednesday. This is definitely a great news especially for those users who feel the current design of Gmail interface is a bit too plain. It could be part of the reason why there are Greasemonkey scripts and Firefox plugin being developed some times ago that allow you to spice up the standard Gmail theme. In order to satisfy user’s demands, Google has finally planned to release 30 different themes for Gmail’s users in the next couple of days. Typically the themes can be divided into different categories. Some of them are shiny theme with chrome styling, notepad retro, nature themes that change scene dynamically over time. Also there are weather driven themes that can emulate rain falling on your mailbox as well as some with fun characters style for selection. Even for the default Gmail interface, there is some minor changes as well as compared to current one. Some lucky users may already have chance to see this new feature available at Themes tab under Setting menu. However, it might take few more days in order to roll out this feature to worldwide’ users completely as some times is required to install this feature to all Google’s servers. For those that haven’t gotten this feature available, be patient to wait for one or two more days. In overall, these new themes will definitely able to attract wide population of users with different tastes that would like to personalize their own Gmail Inbox from time to time.